Citrus trees are deciduous fruit-bearing trees that include lemon trees, grapefruit trees, lime trees and orange trees. They usually grow in subtropic or tropic environments, although some varieties have been known to grow inside as container plants. Aside from freezing temperatures and occasional pest problems, citrus trees are low-maintenance and easy to care for. Provide citrus trees with a fertilizer containing nitrogen, potassium and phosphorous, as well as micronutrients like magnesium, zinc and copper. You can purchase a citrus tree fertilizer, or an all-purpose fertilizer containing these ingredients at your local garden supply store or nursery. According to Tree Help, purchase a slow-release fertilizer that you replace every few months in order to provide the best long-term nutrient care. Bank your trees during the fall to prevent your citrus trees from freezing damage. If you live in an area that does not reach below freezing point, bank your soil as a precaution, but if you live in an area where temperatures drop below 32 degrees Fahrenheit, banking your trees is necessary. Pile clean soil about 15 inches in the air around the tree trunk and press firmly. This will insulate the tree during the winter months and absorb sunlight to make trees up to 15 degrees warmer. Prune your citrus tree once every 2 years, or once a year at the most to promote healthy, new growth. 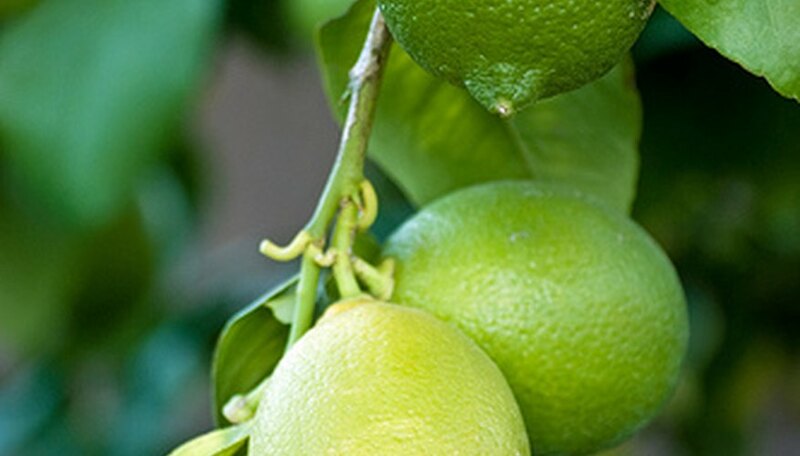 The best time to trim a citrus tree is just before the tree blooms, but after any chance of frost. In most parts of the United States, this time will occur between January and March. Using pruning shears, trim away any branches that appear dead, and any branches that are crisscrossed, especially towards the center of the tree. Opening the tree up to receive more sunlight will promote more growth and create a healthier tree. Know the signs of disease. Observe your tree's leaves. If there are any yellow spots on the leaves, your tree may have citrus canker or greasy spot and require a fungicide spray, which you can purchase at your local gardening store. Observe the bark on your tree. Are there any dark brown spots? If so, your tree may have root rot, which requires a root rot fungicide, like Agri-Fos (see Resources), and all tree branches that hang lower than 2 feet above the ground must be trimmed away. Observe the tree for signs of insects and pests. If the leaves on your citrus tree appear blackened in some areas, your tree may be infested with whiteflies or mealybugs. These bugs require an insecticide spray containing pyrethrin, which you can purchase at your local nursery. Curled, silver-colored leaves indicate a citrus thrip infestation, which can be remedied with a spray containing spinosad, available at your local nursery or garden supply store. Most insects, including aphids, citrus bud mites, and citrus red mites can all be treated with an insecticide made for citrus trees, which are available at nurseries and garden supply stores nationwide. Remove all tree clippings from around your citrus tree to allow more minerals and water to absorb into the roots.